Hello everyone, welcome. I am pleased to say that of late I have been finding time to work on the fiction that will eventually become a novel (and then more, hopefully) and whilst I am not prepared to talk about contents prior to release, something did occur to me that I wanted to share. Over my many years of learning the craft of writing I have watched writing help guides, read books and blogs and built a knowledge base with which to approach the craft. I have encountered many theories on what you should/should not do and how you should/should not start. I am going to be examining two perspectives on how to start. In this case, to plan or not to plan (and then I am going to put my spin on it). I have written about planning in relation to roleplay games, as it is an area of interest to me and you can read that particular article HERE. In that post I talk about plotting what has gone on before, and then letting a game grow organically. This was referred to as being a Gardner Writer in a George RR Martin Interview I watched on Sky Atlantic, years ago (right before the first episode of Game of Thrones). The Gardner plants seeds, the before plot, and sees what flowers grow. The other type of writer referred to in that documentary was the architect, the writer who plans the entire house right down to the plumbing before starting building. When I started writing I was certainly closer to Architect than Gardner, though the problem with that was I spent so long working on background I never actually got started. I then encountered a statement, that I believe was from Stepen King (though I cannot recall the source so I won’t swear it to you) that stated that planning to that (or similar extent) was the actions of a dullard. I was a bit put out by this, for about five minutes, then I remembered that just because something works for another doesn’t mean it will work for you. And even successful people aren’t right all the time. 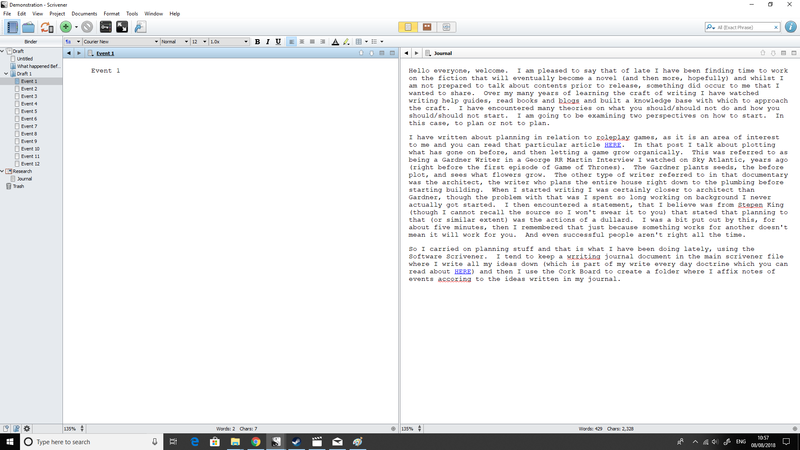 So I carried on planning stuff and that is what I have been doing lately, using the Software Scrivener. I tend to keep a writing journal document in the main scrivener file where I write all my ideas down (which is part of my write every day doctrine which you can read about HERE) and then I use the Cork Board to create a folder where I affix notes of events according to the ideas written in my journal. In the image, on the right is my ideas jornal, far left is the ring binder with all of the contents (including notecards for individual events) and left of the journal but right of the binder is one empty note card. That is the standard screen I work on. So far, this is only brainstorming and slightly more technologically sophisticated brainstorming at that. Brainstorm your ideas and then organise them. And, with scrivener, you can move the note cards around easily, so if you want to rearrange the order that is easy. In the process of making note cards with a title describing an event in the timeline, I started adding paragraphs of information to describe what I wanted to happen, and what impact I was trying to achieve. And some would argue that this is over-planning. I am going to argue something that I have not encountered yet in my learning of the craft. This collection of detailed notes, in chronological order isn’t a plan anymore. It constitutes the first draft. I am imagining some people shaking their heads and saying things like “No. Just, no.” at that thought. Go with me. First drafts rarely, if ever, resemble finished drafts. They are simply meant to be about getting ideas on the page in one form or another, arranged in the order you want them to appear. As a standard rule of thumb, you shouldn’t edit as you write as the two processes us different parts of your brain, so the first draft won’t be perfect prose anyway. What difference does it make if it is simply a couple of haphazard paragraphs per chapter describing what is going on. I’m with you so far, so what? If you are thinking so what, that is a fair question. I can suggest a couple of advantages to this method. First is the psychological advantage. A first draft seems less daunting if it is not a 90000 word manuscript. And you don’t have the same sort of pressure on you if you are simply adding ideas to the pot and arranging them. We get a bit panic-stricken when we look at an empty page thinking that it needs 90000 words to fill it. But if you can build your first draft a couple of hundred words, that don’t need to be perfect, at a time then the fear is gone. Second, once you have what you think is your complete first draft, it will be much quicker to read through multiple times to see if events need foreshadowing hints, or preceding events to set them up/add impact. Imagine reading through 300 pages and realising you need to add a chapter. Then reading them again and realising you need another… Now imagine it is 15 pages of notes instead. Third, your second draft, which probably is when you really get down to it and start writing prose, has a road map now. You just need to read your first draft of a chapter, think of it as a synopsis and start writing what you think achieves the goals best. And finally, once you have laboured through many drafts, you can use your initial notes (the ones that are still relevant) to make a sort of editorial checklist. You can write down all the things you were trying to achieve and as you, or even beta readers, read the manuscript you can check off what you managed to do and what is still missing. What are your thoughts on this? Does it sound useful to you? Do you have any suggestions? I’d love to hear them!